On December 22, 2015, the Iraqi Army, assisted by Shiite militias and Sunni tribesmen, and with air support from the US-led coalition, began a military attack to liberate the city of Ramadi (most of whose residents had fled). 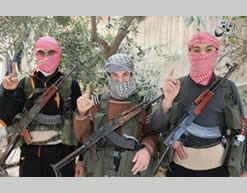 Ramadi is the capital of the Sunni Al-Anbar province, located some 100 km from the capital, Baghdad. 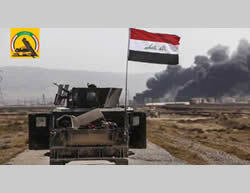 The current operation comes after several months in which the Iraqi Army tightened the siege on Ramadi, facing ongoing guerilla warfare by ISIS operatives. According to Iraqi and Western sources, the Iraqi Army has advanced to the city center, which is defended by several hundred ISIS operatives, and “the great battle” for the liberation of the city is expected to take place within a few days. If the Iraqi forces manage to liberate the city of Ramadi, it will be the most notable setback suffered by ISIS in Iraq since the pinnacle of its achievements in the summer of 2014. 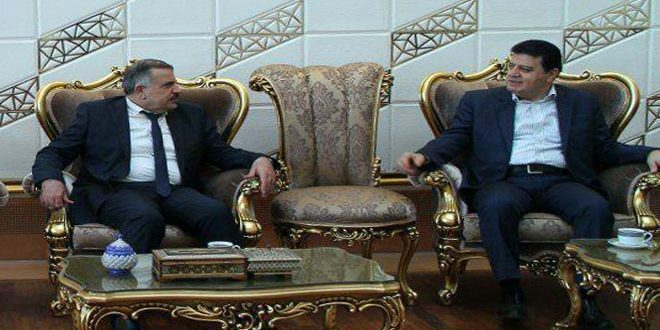 This failure will be a continuation of the removal of ISIS from the cities of Baiji (late October 2015) and Tikrit (early April 2015), north of Baghdad. Assuming the city falls into the hands of the Iraqi forces, its loss would be a military setback for ISIS and a blow to its image.This is because it could undermine ISIS’s control over other cities in the Al-Anbar province, from which ISIS emerged, including its control over the city of Fallujah, which lies between Ramadi and the capital, Baghdad. Saudi Arabia has announced the establishment of an Islamic coalition to fight terrorism, comprising 35 Sunni Muslim countries in the Middle East, Africa and Asia. At this stage, the nature of the coalition’s activity and the extent to which its members will be prepared to engage in joint military operations against ISIS are still unclear. The US has expressed its support for the coalition while Russia has expressed doubts regarding its necessity. ISIS (as usual) has responded with a campaign fraught with threats against the Saudi royal family. Syria– the airstrikes were concentrated in the area near Ain Issa, Marea (north of Aleppo), and Al-Raqqah. The airstrikes hit ISIS operatives and destroyed battle positions, vehicles, and artillery positions. Iraq– the airstrikes were concentrated in the areas of Ramadi, Sinjar, Al-Baghdadi, Kisik, Mosul, Fallujah, and Hit. The airstrikes targeted ISIS operatives, a car bomb workshop, vehicle convoys, roads used by ISIS, and artillery, among other things. According to sources in the US defense establishment, the Russian operation in northern Syria has led to substantial disruption of the US relief efforts among the moderate rebel forces. In addition, the United States has reportedly ceased to perform manned combat flights in northwest Syria in light of the danger posed to them following the deployment of advanced Russian air defense systems. According to the sources, the subject came up during US Secretary of State John Kerry’s visit to Moscow and in a talk between Chairman of the Joint Chiefs of Staff General Joseph Dunford and his Russian counterpart (Express, December 17, 2015). The Pentagon is reportedly considering expanding its cyber attacks against ISIS.The assumption is that adopting more aggressive measures to paralyze computers, servers and mobile phones of “extremist groups” would significantly help prevent possible terrorist acts. The US Army Cyber Command has developed malware that could be used to sabotage ISIS’s propaganda and recruitment capabilities. According to reports, intelligence agencies are opposed to the implementation of these cyber capabilities because blocking access to social networks, websites and mobile phones in Syria and Iraq could make it impossible to obtain vital information about ISIS’s intentions and the location of its operatives and leaders (thestar.com, December 20, 2015). The French aircraft carrier Charles de Gaulle reportedly held its first operations against ISIS in Syria and Iraq from the Persian Gulf, where it is stationed (Defence Talk, December 21, 2015). In advance of his upcoming visit to Moscow, French Minister of Defense Jean-Yves Le Drian announced that France intended to ask Russia to increase its activity against ISIS and its cooperation with France. According to the French minister, France would offer Russia exchanges of intelligence and mutual updating of plans for the war against terror (AFP, December 21, 2015). In the area of Homs, the Russian Air Force carried out 59 combat sorties, attacking 200 targets. The targets attacked included weapons storehouses and underground bases used by ISIS as command and control centers. In the airstrikes in the area of Idlib, dozens of Jaysh al-Fatah operatives were killed and dozens more were injured (Al-Jazeera TV, December 20, 2015). According to Arab media allegations, the Russians also attacked civilian buildings in Idlib, including a clinic, killing 43 people and injuring 150. The Russian Defense Ministry has denied these reports (The Guardian, December 20, 2015). During the past week’s airstrikes, Russian aircraft destroyed six oil production facilities and hit seven convoys carrying oil and oil products. According to Russian Defense Ministry Spokesman Igor Konashenkov, Russian Air Force airstrikes in the area of Deir al-Zor and Al-Hasakah damaged 15 fuel tanker loading stations and destroyed about a hundred tankers. He believes that Russia has reduced ISIS’s revenues from the oil trade by around fifty percent (from USD 3 million to USD 1.5 million a day). According to Konashenkov, since the beginning of the Russian operation in Syria, the Russian Air Force has destroyed more than 1,200 oil tankers (TASS, December 15, 2015). Speaking at a press conference, Russian President Vladimir Putin said that the US and Russia see eye to eye with regard to possible solutions to the crisis in Syria. He reiterated Russia’s position that the airstrikes in Syria would continue as long as Syria ask Russia to continue them. In a documentary aired on Russian television, the Russian President says that the Russian military operation has proved effective and reflects cooperation between the Air Force, the Navy, the Russian Army and intelligence community in Russia. Putin adds that only part of Russia’s capability is manifested in Syria and that Russia is prepared to employ additional military measures, if necessary. On the other hand, Russian Minister of Defense Sergey Shoygu reiterates that Russian Army forces will not take part in ground operations in Syria (RT, December 20, 2015). 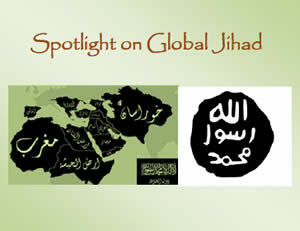 As part of the international and regional campaign against ISIS, Saudi Arabia has announced the establishment of an Islamic coalition to combat terrorism.The members of the coalition are 35 Sunni Muslim countries in the Arab world, Africa and Asia, including the Gulf States (except Oman), Turkey, Jordan, Egypt, Lebanon, the Palestinian Authority, Pakistan and others. According to the Saudis, 10 other countries have expressed support in principle for the coalition and may join it soon. According to Deputy Crown Prince Muhammad bin Salman, the coalition will operate in areas such as Iraq, Syria, Libya, Yemen and Egypt. He noted that the coalition would take care to operate in coordination and agreement of all the legitimate local entities and the international community (Reuters, December 14, 2015). For the time being, the nature of the coalition’s expected activity and the extent to which its members will be prepared to engage in joint military operations against ISIS are still unclear. In any case, the US has expressed its support for the coalition.US Secretary of Defense Ashton Carter welcomed the move, calling it a significant contribution to the fight against ISIS. According to the spokesman of the US Secretary of Defense, the US government is studying the issue and, in any case, this coalition is separate from the US-led coalition. According to Russian President Vladimir Putin, the issue must be studied and the goals of the Islamic coalition and its participants must be analyzed. He subsequently expressed doubt about the necessity of the coalition led by Saudi Arabia in light of the existence of the US-led coalition (Reuters; Al-Arabiya TV, December 14, 2015). This week as well, there have been no significant changes on the ground: fighting continued in the Homs province between the forces of the Syrian regime and ISIS operatives, near the village of Mheen and the town of Sadad, southeast of Homs. In the Aleppo province, clashes continued between ISIS operatives and the forces of the Syrian regime in the area of the Kuweyres military airbase east of Aleppo. In the Deir al-Zor province, ISIS operatives took over several positions near the airport, but the Syrian Army still controls the airport. North of Latakia, Syrian troops took over part of the rural area and regained control of the area. According to a report on an ISIS website on December 19, 2015, ten members of the Syrian regime forces were killed in clashes with ISIS operatives while attempting to advance along two routes in the area of Jabal al-Hazm, between the towns of Mheen and Sadad, southeast of Homs (see map). According to ISIS, its operatives destroyed three Syrian Army tanks and anti-aircraft weapons (Aamaq, December 19, 2015). According to a report from December 21, 2015, the Syrian security forces attacked and killed a group of ISIS operatives in the village of Mheen (Dimashq al-Aan, December 21, 2015). ISIS continues its attempts to attack the Syrian forces at the Kuweyres military airbase, east of Aleppo. ISIS operatives attacked the airbase with rockets and sniper fire.On December 17, 2015, an ISIS operative carried out a suicide bombing attack against Syrian Army troops north of the airbase. According to ISIS, many soldiers were killed in the attack, including an officer with the rank of colonel. After the attack, there were clashes between the Syrian Army and ISIS operatives, who attacked several villages northeast of the airbase (Aamaq, December 18, 2015). On the other hand, Syrian television broadcasta live film documenting the resumption of operations at the Kuweyres military airbase, after having been inoperative for three and a half years. The film shows fighter planes taking off and landing at the airbase. According to the announcer, the airbase will now serve as a point of departure “for the destruction of ISIS’s strongholds and terrorist sites in the east of the province” (Syrian TV, December 15, 2015). However, despite the Syrian propaganda, it is unclear whether the airbase is fully operational. According to a report from December 16, 2015, ISIS operatives have taken over three Syrian Army positions in the area of Al-Jafra, southeast of Deir al-Zor, near the city’s airport. 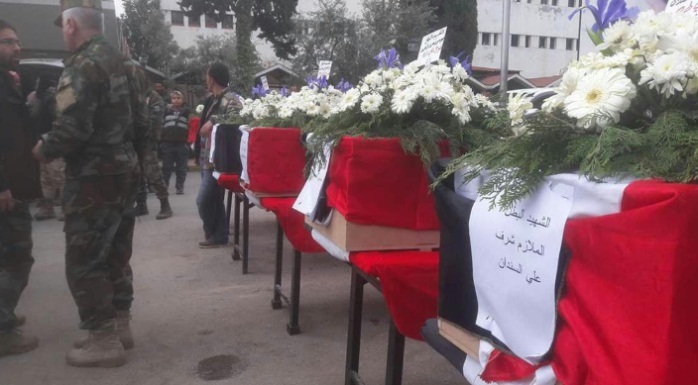 ISIS operatives reportedly attacked the positions and killed seven Syrian soldiers (a3maqnews.tumblr.com, December 16, 2015). On December 17, 2015, ISIS detonated a car bomb in a staging zone of the Syrian security forces in the airport area (Local Coordinating Committees, December 17, 2015). The Syrian Army managed to regain control over the rural area north of Latakia, after clashes with operatives of the Al-Nusra Front and the Free Syrian Army (Al-Masdar, December 16, 2015). A Twitter account affiliated with the Syrian regime reported that the Syrian Army, with the support of the Russian Air Force, had managed to regain control of 56 sites in the rural area northeast of Latakia (Twitter, December 18, 2015). Three ISIS operatives wearing explosive belts carried out a suicide bombing attack at a checkpoint of the Kurdish forces (YPG). The attack was carried out at the entrance to the village of Hammam al-Turkman, north of Al-Raqqah and near the Turkish-Syrian border. The Kurdish fighters manning the checkpoint were apparently killed in the attack (a3maqagency.wordpress.com, December 18, 2015). Fighting continued in the southern Syrian Golan Heights and in the area of Daraa between the ISIS-affiliated Al-Yarmouk Martyrs Brigade and Jaysh al-Fatah, led by the Al-Nusra Front.In addition, the Syrian security forces in Daraa reportedly attacked the Al-Nusra Front’s supply route in Daraa and concentrations of militants in the Al-Manshiya neighborhood (Dimashq al-Aan, December 17, 2015). There were also clashes between Jaysh al-Fatah and the Al-Yarmouk Martyrs Brigade on the outskirts of the town of Saham al-Jawlan(Khatwa, December 18, 2015; Radio Sham, December 21, 2015). The Al-Nusra Front has announced the appointment of Abu Ahmad al-Shami as its commander in southern Syria, in place of Abu Jalibib al-Tubasi(Khatwa, December 17, 2015). Following reports that Abu Jalibib had been killed or seriously injured, the Al-Nusra Front said that Abu Jalibib had been removed from his position. Ahmad al-Shami, a Palestinian by birth, served as Abu Jalibib’s deputy. He previously held several positions in the Al-Nusra Front, including commander (“Emir”) of the eastern region and the Al-Nusra Front’s representative in Jaysh al-Fatah in the south. Abu Ahmad al-Shami reportedly has ties with the influential Jordanian Salafist Sheikh Abu Muhammad al-Maqdisi (As-Safir, December 18, 2015). On December 22, 2015, the Iraqi Army began a military action to liberate the city of Ramadi, the capital of the Sunni Al-Anbar province, the largest in Iraq. The city of Ramadi, located about 100 km from the capital Baghdad, fell into the hands of ISIS on May 15, 2015. In retrospect, its takeover marked the pinnacle of ISIS’s achievements in Iraq. If the attack succeeds and Ramadi is liberated by the Iraqi forces, this would amount to a severe setback for ISIS and the latest in a series of failures that ISIS suffered in Iraq during 2015 (the loss of the cities of Tikrit and Baiji, north of Baghdad). The loss of Al-Anbar is liable to undermine ISIS’s position in other important strongholds in the Sunni Al-Anbar province, ISIS’s support base, from which it spread to other provinces in Iraq. According to Iraqi intelligence estimates, there are 250-300 ISIS operatives in Ramadi, as well as a few hundred supporters. They face approximately 10,000 Iraqi troops, assisted by Shiite militiamen and local Sunni tribesmen (Reuters, December 21, 2015; Reuters and Haaretz Israeli daily, December 23, 2015; Al-Hurra, December 19, 2015; ARA News, December 19, 2015). 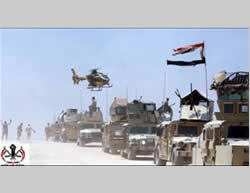 The Iraqi forces are advancing with air support by the international coalition and the Iraqi Air Force (Al-Arabiya TV, December 17, 2015). In recent months, the Iraqi forces have tightened the siege on the city of Ramadi, with coalition air support. ISIS defended the city through a defense system that it had set up and, at the same time, conducted a guerrilla war against the Iraqi forces. 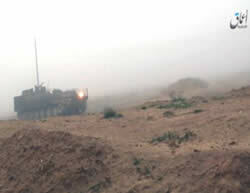 The guerrilla activity included surprise attacks against the Iraqi forces, planting IEDs on the roads leading to Ramadi and deploying suicide bombers. All this was done in order to disrupt the Iraqi Army’s preparations for taking over the city, prevent Ramadi from being surrounded, and impede the movement of Iraqi Army troops along the main roads. Before the current attack, the Iraqi Army called on the city’s remaining residents to leave their homes within 72 hours. On the other hand, the Iraqi defense ministry claimed that ISIS operatives had prevented the residents from leaving the city in order to use them as human shields (Reuters, December 21, 2015). It is not yet clear how far the Iraqi forces have advanced in the city, but they are apparently advancing toward the city center and may already be nearby (as at December 23, 2015). Iraqi security officials quoted by Reuters estimated that the major battle for cleansing Ramadi of ISIS operatives would take place in a few days. According to a report by ISIS’s media foundation, ISIS operatives attacked an Iraqi Army headquarters in the area of Zawbaa, southeast of the city of Fallujah, and managed to take it over. According to ISIS, the Iraqi forces suffered 15 losses (Aamaq, December 17, 2015). In the ITIC’s assessment, the city of Fallujah, which lies between Baghdad and Ramadi, will be targeted by the Iraqi forces when the liberation of the city of Ramadi is completed. ISIS continues to initiate attacks in Baghdad.On December 21, 2015, an Iraqi policeman was wounded by a roadside IED in southwest Baghdad. ISIS was apparently behind the attack (Al-Sumaria, December 21, 2015). ISIS continues its efforts to undermine the Iraqi Army’s control of the city of Samarra, north of Baghdad, and the surrounding areas.According to a report by ISIS’s media foundation, four of its suicide bombers blew themselves up, using an APC bomb and a booby-trapped tractor against the Iraqi security forces west of the city of Samarra. Following the incident, there were clashes between ISIS operatives and the Iraqi forces (Aamaq, December 17, 2015). According to a report posted on an ISIS-affiliated website on December 20, 2015, ISIS fired four rockets and 15 mortar shells at Iraqi Army bases in the city of Samarra (Akhbar al-Muslimeen, December 20, 2015). According to a report by American security sources, there were clashes this week in the Erbil-Mosul region between ISIS operatives and the Kurdish Peshmerga forces. These clashes were the fiercest in the past five months. According to Peshmerga sources, 40 ISIS operatives and a few Peshmerga fighters were killed in the attack carried out by ISIS against the Kurdish forces in southeastern Mosul (BBC in Arabic, December 18, 2015). During the week, the Egyptian security forces continued their military operations against ISIS’s Sinai branch. In this context, they carried out intensive security activity, mainly in the area of Rafah, Sheikh Zuweid, and Al-Arish.According to Egyptian sources, many terrorist operatives were detained, infrastructure was destroyed, and cars and motorcycles were confiscated. This week, the Egyptian security forces reportedly launched an extensive security operation in the area known as Wadi al-Lussan where there are terrorist hiding places. During searches in the region, books with extremist Islamic content and night vision binoculars were seized (Veto portal, December 20, 2015). Two senior operatives from ISIS’s Sinai province, Ibrahim Abu Qaria and Ahmad Sal Abu Zureiq, were killed when the car in which they were traveling was attacked by helicopters south of Rafah (Veto portal, December 21, 2015). On December 20, 2015, an IED exploded near an APC of the Egyptian security forces on the coastal road in Al-Arish, near the Swiss Inn Hotel. There were no casualties. ISIS’s Sinai province claimed responsibility for the attack (ISIS-affiliated Twitter account, December 20, 2015). According to ISIS’s announcement, its operatives detonated an IED against a convoy of Egypt’s North Sinai deputy director of security, which was travelling on the coastal road in Al-Arish. It was also reported that the attack was in retaliation for the detention of Bedouin tribeswomen in Sinai (Akhbar al-Muslimeen, December 20, 2015). On December 19, 2015, sappers neutralized an IED planted on the main street in Al-Arish (Al-Masry al-Youm, December 19, 2015). On December 18, 2015, Egyptian security forces detonated a large IED planted on the international highway in Karam al-Kawadis, south of Sheikh Zuweid (Veto portal, December 18, 2015). On December 18, 2015, an IED exploded near an APC belonging to the Egyptian security forces in one of the neighborhoods of Al-Arish. There were no casualties (Al-Youm al-Sabea, December 18, 2015). On December 17, 2015, a number of Egyptian soldiers were killed and injured when an IED exploded in an armored police vehicle in Al-Arish. In consequence, additional checkpoints were set up in the city and more thorough vehicle searches were carried out (Al-Watan, December 17, 2015). The trial of two young men affiliated with ISIS, both aged 21 and born in Berlin, began at a German court on December 16, 2015.The two are charged with planning to carry out an attack at the Israeli Embassy in Germany or another Israeli target in Germany between December 2014 and July 2015. Means for manufacturing a powerful IED were found in the possession of the two men, referred to as Muhammad and Ali (their full names have not been published). The two men were caught in June 2015 while trying to make an IED out of firecrackers. They are affiliated with ISIS, and ISIS content was found on their mobile phone (Ynet, December 16, 2015). 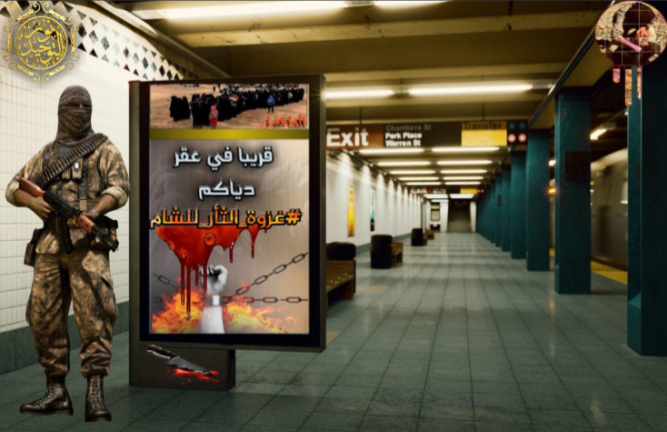 On December 19, 2015, ISIS’s media foundation in the Tripoli province issued a series of photos documenting ISIS’s activities in the city of Sirte. The photos show the morality police operatives (hisba) in the city smashing tombstones in cemeteries, and the activities of the Sharia Court (Akhbar Dawlat al-Islam, December 19, 2015). ISIS operatives in Sirte reportedly confiscated a shipment of dialysis equipment on its way from Tripoli to Benghazi. They transferred the equipment to the hospital in Sirte for “Muslim use” (Akhbar Libya 24, December 18, 2015). ISIS control over sections of the Libyan coastal highway in the area of Sirte effectively creates a geographic disconnect between Tripoli and Benghazi, enabling ISIS to “confiscate” goods and equipment conveyed via the coastal road (or to collect fees for allowing their passage). On December 18, 2015, an ISIS-affiliated website posted a claim of responsibility by its Algeria province for the detonation of two IEDs against an Algerian Army foot patrol in Jabal al-Wahsh, in the city of Constantine, approximately 322 km east of the capital, Algiers. Several soldiers were killed and others were injured in this incident (Akhbar al-Muslimeen, December 18, 2015). As part of its propaganda campaign, ISIS posts infographics on social networks each month, presenting its successes in various areas. On December 19, 2015, an ISIS-affiliated site posted an infographic documenting the attacks carried out by ISIS operatives in West Africa during October and November 2015. During this period, over 100 attacks were carried out against governmental forces, 67 suicide bombing attacks were carried out, over 120 rockets were launched, 24 tanks and 20 vehicles of various types were destroyed, and 27 enemy attacks were halted. A total of 1,000 people were killed and wounded in these incidents. The weapons that fell into the hands of ISIS included: three tanks, an APC, 23 ATVs, small arms and large quantities of ammunition (Akhbar al-Muslimeen, December 19, 2015). It appears that this was primarily activity in Nigeria by Boko Haram, which pledged allegiance to Abu Bakr al-Baghdadi, and possibly also the activity of other jihadi organizations in West Africa. 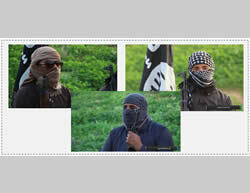 ISIS’s Sinai province recently issued propaganda videos directed against the Saudi regime. One of the videos is entitled: “A message to our relatives in the Land of the Two Holy Places” (i.e., Saudi Arabia). 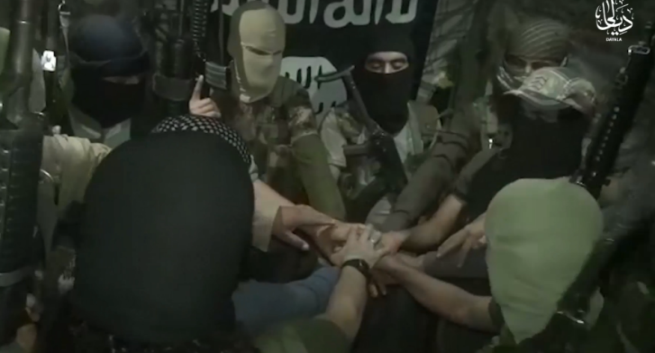 The video shows three masked ISIS operatives making statements against the Saudi royal family. In the ITIC’s assessment, the videos were made in light of the establishment of the Islamic Arab coalition initiated by Saudi Arabia, and ISIS’s intention is to intimidate and deter the Saudi regime. The first speaker, codenamed Abu Osama al-Muhajer, says that ISIS is spreading and will liberate Saudi Arabia as it did in Iraq and Syria. The second speaker, codenamed Abu Fatima al-Jazrawi (i.e., from the Arabian Peninsula), addresses the “lions of the fighting, our brothers” in the provinces of Najd, Hejaz and Bahrain, and expresses support for them in their fight against the “tyrants” (i.e., the Saudi regime and the regime in Bahrain). He notes that Saudi Arabia has become the base of the coalition forces (“the Crusaders”). The speaker addresses the Saudi royal family and its assistants, noting that ISIS operatives are advancing towards them from everywhere, with the help of Allah. The third speaker, codenamed Abu Jaafar al-Ansari, notes that the tyrants in the Arabian Peninsula (the Saudi royal family) supported the Crusaders (the United States and the West) with money and territories, and directly participated in the killing of Muslims in Iraq, Syria, Yemen and Afghanistan (ISIS-affiliated Twitter account; archive.org file-sharing website, December 18, 2015). The oil city of Baiji fell into the hands of the Iraqi forces in late October 2015. The city of Tikrit, stronghold of former Iraqi ruler Saddam Hussein, fell into the hands of the Iraqi forces in early April 2015.